The eight-year-old boy had vanished from the car and - as if by slick, sick magic - had been replaced by a note on the steering wheel...'You don't love him'...At the height of summer a dark shadow fa lls across Exmoor. Children are being stolen from cars. Only a terse note - a brutal accusation, marks each disappearance. There are no explanations, no ransom demands ...and no hope. Policeman Jonas Holly faces a precarious journey into the warped mind of the kidnapper if he's to stand any chance of catching him. But - still reeling from a personal tragedy - is Jonas really up to the task? Because there's at least one person on Exmoor who thinks that, when it comes to being the first line of defence, Jonas Holly may be the last man to trust... Finders Keepers is by the CWA Gold Dagger winner Belinda Bauer and is due to be published in January 2012. Imagine the unimaginable – You’re happily married, but your husband dies unexpectedly, and at his funeral you are confronted by a woman who says, ‘I’m Lottie, I’ve shared a home with your husband for the last twenty years. This is our son.’ The Wife’s Dossier is a psychological thriller focusing on a woman who learns at her husband’s funeral that he had another family. The betrayed wife’s quest is to get to the bottom of her late husband’s double life and mysterious death and, in doing so learns who and what she really is. The Wife’s Dossier is by Tamar Cohen and is due to be published in June 2012. Siege is by Simon Kernick and is due to be published in January 2012. London is under attack. People are dead. Many more lives hang in the balance as a group of highly trained gunmen storm the historic Lanchester Hotel on Park Lane. The gunmen have given the governm ent just five hours to meet their demands before they blow up the building. Shots ring out. Some guests panic. Others text their loved ones. Still more try to escape. All are united by one thing: fear for their lives. All - except one man who has information so dangerous that it must be kept safe - at any price. Darkness falls. The gunmen become increasingly violent. One question is in everybody's minds. Will they survive the night? A critically acclaimed thriller spanning twenty-five years, centred around the still unsolved murder of Prime Minister Olof Palme in 1986. Stockholm 1975: Six young people take the entire staff of the West German embassy hostage, demanding that the Baader-Meinhof members being held as prisoners in West Germany be released immediately. The long siege ends with the deaths of two hostages and the wounding of several others, including the captors. 1989: When a Swedish civil servant is murdered, the two leading detectives on the case, Anna Holt and Bo Jarnebring, find their investigation hastily shelved by an incompetent and corrupt senior investigator. 1999. Lars Johansson, having just joined the Swedish Security Police, decides to tie up a few loose ends left behind by his predecessor: specifically, two files on Swedes who had allegedly collaborated on the 1975 takeover of the West German embassy, one of whom turned out to be the murder victim in 1989. Johansson reopens the investigation and, with help from detectives Jarnebring and Holt, follows the leads - right up to the doorstep of Sweden's newly minted minister of justice. Another Time, Another Life is by Leif G W Persson and is due to be published in March 2012. The Contract is by David Levien and is due to be published in January 2012. The Company: Troubled former cop Frank Behr is working for an exclusive Indianapolis investigation company, when he finds himself on a protection detail for Bernard "Bernie Cool" Kolodnik. The Client: Bernard "Bernie Cool" Kolodnik is a hard driving business mogul on the verge of making a move into big-time politics. The Corrupt: An attempt on Kolodnik's life is quickly buried by the police. But Behr wants the truth, and his hunt will put him a collision course with a dangerous sociopath... Frank Behr, working for a high-end investigation company, is tasked with protecting businessman, Bernard Kolodnik, who is on the precipice of making the move into politics. And when an attempt is made on the prominent client’s life, Behr manages to repel the attackers and get himself and Kolodnik to safety. Behr returns to work the following day, greeted by a round of applause from his co-workers, and is soon placed on a new case concerning a string of robberies. But while it seems everyone has moved on from the attempted shooting, the circumstances of the failed Kolodnik hit nag Behr and he soon discovers his probing and is urged by his superiors to let it go as well. But this only fires his suspicions further. Soon Behr discovers a link between his company and massive corruption where politics, law enforcement, and a state work contract worth hundreds of millions of dollars intersect. Embroiled in a perilous situation, Behr must rely on his guts, his skill and the help of an unlikely new friend if he is to live to see the birth of his child. The Rings of Olympus is by James Becker and is due to be published in June 2012. Chris Bronson is back in this edge-of-your seat thriller involving a secret Nazi WW2 weapon and a plot against the 2012 London Olympics. Berlin, 1936: Hitler is determined to hold the best Olympic Games the world has ever seen. German athletes have trained full-time to ensure that ‘Aryans’ take all the top honours. Unfortunately, the African-American Jesse Owens spoils their plan, winning four gold medals. In a secret Nazi underground laboratory, scientists are at work on a devastating revenge. London, 2012: Chris Bronson is working undercover for the Metropolitan Police, infiltrating a group of anarchists who have been smashing windows, sabotaging machinery and even digging tunnels under some of the Olympic sites in attempts to disrupt the Games. But he uncovers a plot that hints at a much more sinister plan and will lead him on a chase into the dark corners of German’s Nazi past. 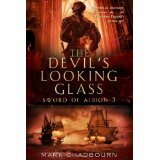 The Devil’s Looking-Glass is by Mark Chadbourn and is the third in the swashbuckling supernatural adventure featuring Elizabethan England’s answer to James Bond, the dashing swordsman and spy, Will Swyfte. 1593: The dreaded alchemist, black magician and spy Dr John Dee is missing...Terror sweeps through the court of Queen Elizabeth, for in Dee's possession is an obsidian mirror, a mysterious object of great power which legend says could set the world afire. And so the call goes out to celebrated swordsman, adventurer and rake Will Swyfte - find Dee and his feared looking glass and return them to London before disaster strikes. But when Will discovers the mirror may help him solve the mystery that has haunted him for years - the fate of his lost love, Jenny - the stakes become acutely personal. With a frozen London under siege by supernatural powers, the sands of time are running out. Will is left with no choice but to pursue the alchemist to the devil-haunted lands of the New World - in the very shadow of the terrifying fortress home of England's hidden enemy, the Unseelie Court. Surrounded by an army of these unearthly fiends, with only his sword and a few brave friends at his back, the realm's greatest spy must be prepared to make the ultimate sacrifice - or see all he loves destroyed. They are known as the Legion of the Damned...Throughout the Roman Army, the XIIth Legion is notorious for its ill fortune. It faces the harshest of postings, the toughest of campaigns, the most vicious of opponents. For one young man, Demalion of Macedon, joining it will be a baptism of fire. And yet, amid all of the violence and savagery of his life as a legionary, he realises he has discovered a vocation - as a soldier and a leader of men. He has come to love the Twelth and all the bloody-minded, dark-hearted soldiers he calls his brothers. But just when he has found a place in the world, all that he cares about is ripped from him when, during the brutal Judaean campaign, the Hebrew army inflict a catastrophic defeat upon the legion - not only decimating their ranks, but taking away their soul - the eagle. There is one final chance to save the legion's honour - to steal back the eagle. To do that, Demalion and his legionnaries must go undercover into the city of Jerusalem, into the very heart of their enemy, where discovery will mean the worst of deaths, if they are to recover their pride. And that, in itself, is a task worthy only of heroes. Rome: The Eagle of the Twelfth is by M C Scott and is due to be published in May 2012. Vanished is by Liza Marklund and is due to be published in February 2012. People can’t just disappear… or can they? Five murders in one week, a smuggling operation gone wrong, and a crime repor ter desperate to find the truth…. At a derelict port in Stockholm, a young woman is on the run from a deranged gunman. The following morning, two brutally murdered men are found by a security guard patrolling the area. Meanwhile, Annika Bengtzon of the Evening Post is approached by a woman claiming to have founded an organisation able to erase people’s pasts. She says it can give vulnerable individuals a new identity and help to rebuild their lives. But as Annika investigates her claims, more bodies turn up and she finds herself getting dangerously close to the truth – that all is not as it seems….. Fatal Frost is by James Henry and is due to be published in May 2012. May 1982. Britain celebrates the sinking of the Belgrano, Jimmy Savile has the run of the airwaves and Denton Police Division welcomes its first black policeman, DC Waters – recently relocated from Bethnal Green. While the force is busy dealing with a spate of local burglaries, the body of fifteen-year-old Samantha Evans is discovered in woodland next to the nearby railway track. The a fifteen-year-old boy is found dead on Denton’s golf course, his organs removed. Detective Sergeant Jack Frost is sent to investigate – a welcome distraction from troubles at home. And when the murdered boy’s sister goes missing. Frost and Waters must work together to find her before it’s too late. “We must prise opinion from fact, belief from supposition and guesswork from whatever evidence must exist...” It is surely a simple case of hysteria. Four young women allegedly witness a terrifying apparition while walking in the woods. Has the devil really revealed himself to the m? Are they genuine victims of demonic possession? Or, as most suspect, is their purpose in claiming all of this considerably more prosaic? The eyes of the country turn to a small Nottinghamshire town, where an inquiry is to be held. Everyone there is living through hard, uncertain times. The king is recently dead. It is a new century - a new world looking to the future. But here, in the ancient heart of England, an old beast stirs...Four men must examine the substance of the girls' tales and decide their fate: a minister, a doctor, a magistrate, and Merritt, an investigator - a seemingly perfect blend of the rational, the sacred and the judicial. And yet, as the feverish excitement all around them grows ever more widespread and infectious, there is both doubt and conflict among the members of this panel. The "Devil's Beat" explores the unforeseeable and unstoppable outcome of this inquiry - an alarming and unsettling time during which the whole of that small world seems in turmoil as one after another hitherto dependable natural checks and balances, beliefs and superstitions are challenged and then lost. Devil’s Beat is by Robert Edric and is due to be published in March 2012. The Queen’s Secret is by Victoria Lamb is due to be published in March 2012. It's July 1575: Elizabeth I, Queen of England, arrives at Kenilworth Castle amid pomp, fanfare and a wealth of lavish festivities, laid on by the Earl of Leicester. The hopeful Earl knows this is his very last chance to persuade the Queen to marry him. But despite his attachment to the Queen and his driving ambition to be her King, Leicester is unable to resist the seductive wiles of Lettice, wife of the Earl of Essex. And soon whispers of their relationship start spreading through the court. Enraged by the adulterous lovers growing intimacy, Elizabeth employs Lucy Morgan, a young black singer and court entertainer, to spy on the couple. But Lucy, who was raised by a spy in London, uncovers far more than she bargains for. For someone at Kenilworth that summer is plotting to kill the queen. No longer able to tell friend from foe, it is soon not only the queen who is in mortal danger - but Lucy herself. Not all scars are visible. Jonathan Kellaway needs no reminding of that on the verge of his retirement from China clay conglomerate Intercontinental Kaolins. The company has left its mark in pits and spoil heaps around the world. But it has also left a no less enduring mark on some of those that have worked for it. Kellaway included. Its past, as well as its future, is a treacherous place. So Kellaway is surprised when IK’s founder and former chairman Greville Lashley, sets him a final task before he quits. The academic hired by the board to write the company’s history has discovered a gap covering several years in the records of the small Cornish china clay outfit Lashley started with and where Kellaway also began his career. He is despatched to Cornwall to learn what has become of the missing documents. But the search is a voyage into dangerous waters. A dead friend, a lost lover and a clutch of mysteries from Kellaway’s youth in Cornwall and Italy in the late 1960s come back to haunt him – and to tempt him with the hope that he may at last learn the truth about the tragedies and misfortunes that blighted those years. It is a truth that has claimed several victims before. If he pursues it hard and long enough, he may only add himself to the list. But pursue it he must. Because the truth, he belatedly realizes, is the secret that has consumed his life. This time – this last time – he will not stop. Until he has found it. 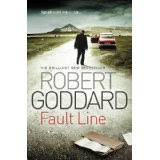 Fault Line is by Robert Goddard and is due to be published in March 2012. Some people help the less fortunate. Others kill them. Evil has many guises. Jack Taylor has encountered most of them but nothing before has ever truly terrified him until a group called Headstone rears its ugly head. An elderly priest is viciously beaten until nearly dead. A special needs boy is brutally attacked. A series of seemingly random, insane, violent events even has the Guards shaken. Most would see a headstone as a marker of the dead, but this coterie of evil intends to act as a death knell to every aspect of Jack’s life as an act appalling violence alerts him to the horror enveloping Galway. Accepting the power of Headstone, Jack realizes that in order to fight back he must relinquish the remaining shreds of what has made him human – knowledge that may have come too late to prevent an act of such ferocious evil that the whole country would be changed forever - and in the worst possible way. With awful clarity, Jack knows that not only might he be powerless to stop it but that he may not even have the grit needed to even face it. Headstone is by Ken Bruen and is due to be published in April 2012. A man wakes up naked and cold, half-drowned on an abandoned beach. The only sign of life for miles is an empty BMW. Inside the expensive car he finds clothes that fit perfectly, shoes for his tattered feet, a Rolex, and a bank envelope stuffed with cash and an auto registration in the name of Daniel Hayes, resident of Malibu, California. None of it is familiar. What is he doing here? How did he get into the ocean? Is he Daniel Hayes, and if so, why doesn't he remember? While he searches for answers, the world searches for him-beginning with the police that kick in the door of his dingy motel, with guns drawn. Lost, alone, and on the run, the man who might be Daniel Hayes flees into the night. All he remembers is a woman's face, so he sets off for the only place he might find her. The fantasy of her becomes his home, his world, his hope. And maybe, just maybe, the way back to himself. But that raises the most chilling question of all: What will he find when he gets there? The Two Deaths of Daniel Hayes is by Marcus Sakey and is due to be published in July 2012. The Dark Angel is by Mari Jungstedt and is due to be published in March 2012. Inspector Anders Knutas is back in the sixth instalment of Mari Jungstedt's dark and compelling series of crime novels, set on the island of Gotland. This crime adventure builds on the already strong series, which combines chilling atmosphere, razor sharp plot twists and a brilliant cast of subtly crafted characters. In "The Dark Angel", Jungstedt's writing is as thrilling and poignant as ever, ensuring that Knutas will continue to have the reader gripped from start to finish. After the glamorous party planner Viktor Algard is found murdered at one of his own glitzy events, Inspector Knutas has several leads to follow. But his investigation uncovers a terrifying trail of abuse which forces Knutas to confront his own demons, and has devastating consequences for TV journalist Johan Berg and his new wife, Emma. When a Cambridge student dramatically attempts to take her own life, DI Mark Joesbury realizes that the university has developed an unhealthy record of young people committing suicide in extraordinary ways. Against hug e personal misgivings, Joesbury sends young policewoman DC Lacey Flint to Cambridge, with a brief to work under-cover, posing as a depression-prone, vulnerable student. Psychiatrist Evi Oliver is the only person in Cambridge who knows who Lacey really is - or so they both hope. But as the two women dig deeper into the darker side of university life, they discover a terrifying trend ...And when Lacey starts experiencing the same disturbing nightmares reported by the dead girls, she knows that she is next. Dead Scared is by S J Bolton is due to be published in April 2012. The Summer of Dead Toys is by Antonio Hill and is due to be published in May 2012. Inspector Salgado is known for his violent moments. He has a murky emotional past and a runaway wife. So he is moved off his current case to investigate the story behind a young boy’s fall to his death from a balcony in one of Barcelona’s uptown areas. Salgado digs deeper, poking at the seedy underbelly of Spain’s most popular city, to unearth a case of human trafficking and voodoo. But Hector’s fierce, complex personality (with his passion for cinema) and a seemingly unresolvable case are set to implode under Barcelona’s hot sun. I am Pilgrim is the debut novel by Terry Hayes and is due to be published in June 2012. When your past comes calling , its time to disappear…. Pilgrim was the codename for a world class and legendary secret agent. The adopted son of a wealthy New York family, he was once head of a secret internal affairs force for US intelligence and held the title ‘Rider of the Blue’. He wrote the definitive book on forensic investigation before disappearing into an anonymous retirement taking the secrets of the Rider of the Blue with him. A Murder in New York: the body of a woman is found face down in a bath of acid, her features have been ripped from her face, her teeth are missing, her fingerprints gone. The rooms have been sprayed with DNA eradicating spray. Someone has seemingly committed the perfect crime using the techniques outlined in Pilgrim’s book. A terrorist known only as The Arab, was radicalised when, as a young boy, he witnessed the beheading of his father in a public square in Saudi Arabia. He has dedicated his life to destroying the special relationship between the Kingdom and the United States. He learnt his trade fighting the Soviets in Afghanistan, and now from hiding in Germany plots a terrible act of mass murder. When NYPD detective Ben Bradley tracks down Pilgrim, neither man can imagine the terrifying journey they are about to begin, as what begins as an unusual and challenging murder investigation leads them into a direct collision with the dark forces of jihadist terrorism. The Last Caesar is the debut historical novel by Henry Venmore-Rowland telling the story of the brutal and bloody power struggle that followed the suicide of Nero – a period in Roman history that came to be called ‘The Year of the Four Emperors’…. AD68: The tyrant emperor Nero has no son and no heir. Suddenly there’s the very real possibility that Rome might become a Republic once more. But the ambitions of a few are about to bring corruption, chaos and untold bloodshed to the many. Among them is a hero of the campaign against Boudicca, Aulus Caecina Severus. Caught up in a conspiracy against to overthrow Caesar’s dynasty, he commits treason, raises a rebellion, faces torture and intrigue – all supposedly for the good of Rome. The boundary between the good of Rome and self preservation is far from clear, and keeping to the dangerous path he’s chosen requires all Severus’ skills as a cunning soldier and increasingly deft politician. And so Severus looks back on the dark and dangerous time history knows as the Year of the Four Emperors, and the part he played - for good or ill – in plunging the mighty Roman empire into anarchy and civil war …. The Last Caesar is due to be published in June 2012. London, 1811. The twisting streets of riverside Wapping hold many an untold sin. Bounded by the Ratcliffe Highway to the north and the modern wonders of the Dock to the south, shameful secrets are largely hidden by the noise and glory of Trade. But two families have fallen victim to foul murder, and a terrified populace calls for justice. John Harriott, magistrate of the new Thames River Police Office, must deliver revenge up to them and his only hope of doing so is Charles Horton, Harriot's senior officer. Harriott only recently came up with a word to describe what it is that Horton does. It is detection. Plymouth, 1564. Young Billy Ablass arrives from Oxford armed only with a Letter of Introduction to Captain John Hawkyns, and the burning desire of all young men; the getting and keeping of money. For Hawkyns is about to set sail in a ship owned by Queen Elizabeth herself, and Billy sees the promise of a better life with a crew intent on gain and glory. The kidnap and sale of hundreds of human beings is not the only cursed event to occur on England's first officially-sanctioned slaving voyage. On a sun-blasted islet in the Florida Cays, Billy too is to be enslaved for the rest of his accursed days. Based on the real-life story of the gruesome Ratcliffe Highway murders, The English Monster takes us on a voyage across centuries, through the Age of Discovery, and throws us up, part of the human jetsam, onto the streets of Regency Wapping, policed only by Officer Horton. The English Monster is based on the Ratcliffe Highway murders, and is by Lloyd Shepherd. It is due to be published in March 2012. The Chamber is the pulse-pounding new thriller from the Executive Producer of 24. When Gideon Davis, ex-international peacemaker, is approached by a man claiming to have information about an impending terrorist attack, even though his career with the government is over, something makes him sit up and listen. Calling on Nancy Clement, his old FBI colleague, Gideon decides to hand the evidence over to new boss, Ray Dahlgren. But when Dahlgren refuses to take Gideon seriously, he is left with only one option – to launch his own investigation. Enlisting the help of his brother, Tillman, to infiltrate a white supremacist group that may be involved, Gideon is thrown into the thick of a revenge plot designed not only to overthrow the government but to bring an end to democracy itself. But when things get messy, Gideon and Tillman will need Nancy’s help if they are to slot the final piece of the puzzle into place and prevent disaster. 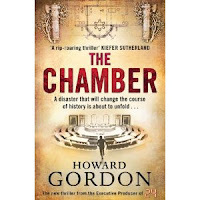 The Chamber is by Howard Gordon and is due to be published in January 2012. The Inquisitor is the debut novel by Mark Allen Smith and is due to be published in March 2012. Meet Geiger, a professional torturer whose methods know no bounds. He is about to embark on his most challenging subject yet...himself. Geiger’s business is extracting information. A meticulous torturer, his methods range from the brutal to the psychologically complex, and he will stop at nothing to get the job done. His clients are referred to him from international corporations, government agencies and organised crime; his skills are in worldwide demand. Geiger only has one rule: that he will never work on a child. So when a client presents Geiger with a twelve-year-old boy, his instinct is to walk away. But the alternative – the unknown horror that might await the boy elsewhere – is too awful for him to contemplate. Geiger’s history is a blank page, even to himself. In accepting this assignment in an attempt to save the boy, he will discover that history, no matter how torturous that proves to be. Good men have stepped over the line. Now they need to cover up their actions, and for that they need to bury Harry Jones... Fifty young Americans are on their way back from a day’s outing to Brussels. But their rapture at returning home is cut short when a bomb blows their plane from the skies above Kent, killing them all. The savage media reaction to the atrocity will sweep away a powerless Prime Minister and his followers at the next election. In nothing less than a coup, Britain is about to be taken over – unless Harry Jones can stop it. But Harry, no longer an MP, finds his path strewn with obstacles. Caught in a web of betrayal by his closest friends, is there anyone who will believe what Harry has to say? The Sentimental Traitor is by Michael Dobbs and is due to be published in February 2012.
has nothing for company but the ghosts of his past when he is woken in the early hours and taken to a secret location. There, he discovers that the Soviets believe they are about to face a nuclear attack by the West – and are planning to strike first as a result. Dark realizes at once that the truth can be found in the final days of the Second World War, and the final mission he undertook as a loyal British agent. Now the fate of the world rests on his shoulders: a traitor long past his best, who is soon the subject of a massive man-hunt. Dark needs to make it to a small Baltic island before it’s too late – and the clock is ticking. From a prison cell, in which he has been held on suspicion of breaking the Official Secrets Act, Charles Thoroughgood awaits not only his bail, but also the reappearance of the woman whom all the major roads in his life have led back to. After his years in the army and then with MI6, Charles has begun a new chapter in his life with the Secret Intelligence Agency, shadowing the movements of a suspected double agent. Charles knows that he has nothing to hide, and as he casts his mind over the course of recent events, he begins to suspect a more sinister motivation, both personally and politically, behind his incarceration. Uncommon Enemy is by Alan Judd and is due to be published in February 2012. Snakes & Ladders is by Sean Slater who is in real life Vancover Police Officer Sean Sommerville. When Homicide Detective Jacob Striker discovers that a string of recent suicides might actually be covered-up murders, his investigation quickly leads him to the Riverglen Mental Health Facility. The victims were all patients from the support group overseen by Dr Erich Ostermann. And when Striker discovers Larisa Logan – a friend of his, and a patient of Ostermann – has gone missing, his investigation goes into overdrive. The evidence tells him one very important fact: that Larisa knows something about the murders. Even worse, she is trapped. She can’t return to the hospital because her own life is in danger, her only chance of living is to escape. Racing against time and a chilling adversary, Striker searches desperately for Larisa. It is a dangerous game they play where one move can catapult you to a place of dominance and one wrong step can leave you sliding to your doom. It is a game of psychopaths. It is Snakes & Ladders. Snakes & Ladders will be published in March 2012. The Elixir is by Dean Crawford and is due to be published in May 2012. While carrying out an autopsy on a body recently brought into a morgue in Santa Fe, county coroner Alexis Cruz makes a surprising discovery. Lodged in the dead man's femur is a musket ball which, carbon dating reveals, was fired some 200 years earlier in the American Civil War. But before she can notify the authorities, Alexis disappears. The DIA call in Ethan Warner and his partner, Nicola Lopez, to find the missing coroner. But the closer they come to unlocking the terrifying truth, the nearer they unknowingly bring a warped and dangerous individual to achieving a catastrophic goal. It’s 1327 and England is in turmoil. Edward II has been removed from the throne and his son installed in his place. Sir Baldwin de Furnshill, tasked with guarding Edward II, has failed and now rides to Exeter to inform the sheriff of the old king’s escape. In Exeter, the sheriff has problems of his own. Overnight, the body of a young maid has been discovered, lying bloodied and abandoned in a dirty alleyway. The city’s gates had been shut against the lawlessness outside, so the perpetrator must still lie within the sanctuary of the town. When Baldwin de Furnshill arrives, he is tasked with uncovering the truth behind this gruesome murder. But, in a city where every man hides a secret, his task will be far from easy. City of Fiends is by Michael Jecks and is due to be published in June 2012.
righteous people on earth. Without them, humanity would perish. In Beijing, a monk collapses in his chamber. A fiery mark has spread across his back and down his spine. In Mumbai, a man who served the poor dies suddenly. Similar deaths are reported around the world – the victims all humanitarians, all bearing the same death mark. In Copenhagen, it falls to veteran detective Niels Bentzon to investigate. He is told to find eight ‘good people’ of Denmark and warn them. But Bentzon is trained to see the worst in people and he becomes increasingly skeptical as he realizes that not everyone perceived to be good is truly good. It is only when Niels meets Hannah that the pair begin to piece together the puzzle. There have been thirty-four deaths and there are two more to come. According to the pattern, Bentzon and Hannah can predict the time and place of the final two. The murders will occur in Venice and Copenhagen. And the time is now. The Last Good Man is due to be published in March 20. 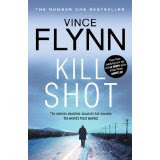 Kill Shot is by Vince Flynn and is due to be published in February 2012. For months, Mitch Rapp has been steadily working his way through a list of the men responsible for the slaughter of 270 civilians including his own girlfriend in the Pan Am Lockerbie bombing - bullet by bullet. His next target - a Libyan diplomat - should be easy. Prone to drink and currently in Paris without a bodyguard, Rapp quickly tracks the man down and sends a bullet into his skull while he's sleeping. But in the split second it takes the bullet to leave the silenced pistol, everything changes. The door to the hotel room is kicked open and gunfire erupts all around Rapp. When the news breaks that Libya's Oil Minister has been killed along with three innocent civilians and four unidentified men, the French authorities are certain that the gunman is wounded and still on the loose in Paris. As the finger-pointing begins, Rapp's handlers have only one choice - deny any responsibility for the incident and race to do damage control. Rapp has become a liability, and he must not be taken alive by the French authorities. But alone in Paris, on the run from the authorities and from his own employers, Mitch Rapp must prepare to fight for his life. For generations the Freyls have ruled Springfield, Illinois, capital of a state of great lakes and rivers. Now convicted killer David Marion threatens their invincibility, and he threatens it from within their own ranks. Water: it’s blue gold, and the price on world markets is soaring. When Springfield gets a new mayor, it finds its supply under threat, not only from corporations out for the money but from a disease that appears from nowhere, that nobody can identify and nobody can treat. None of this interests David Marion until his own past surfaces and he finds himself caught between multinational leviathans at war over America’s heartland. The Blue Death is by Joan Brady and is due to be published in April 2012. 34-year-old psychotherapist Siri Bergman is terrified of the dark. Living alone in an isolated area east of Stockholm, she has tried hard to convince herself that she has moved on since her husband, Stefan, died in a diving accident several years ago. But when she goes to bed, Siri leaves all the lights on and she can’t shake the feeling that someone is watching her through the windows at night. So when one night she wakes up to find that the house is pitch black, and the torch she keeps by her bed for back up is not where she thought she’d left it, it seems that Siri’s worst fears have been realized. And when the lifeless body of Sara Matteus, one of her patients, is found floating in the water near Siri’s house, events quickly spiral. It is clear that Siri is in great danger, and she is thrown headlong into the centre of a murder investigation, which will put each of her closest friends under the spotlight and force her to re-live her troubled past. Some Kind of Peace is by sisters Camilla Grebe & Åsa Träff, one is a writer and the other a psychologist. It is due to be published in May 2012. The Medusa Society is an all-female secret society with a chilling mission. Intent on establishing a new world order, they will set out to destroy New York City and bring down the dollar. Nothing will stand in their way. The new but untitled novel is by Philip Carter and is due to be published in May 2012. Cold as the Grave is by CWA New Blood Dagger shortlisted author Craig Robertson. November 1992. Scotland is in the grip of its coldest winter in 30 years and Lake Menteith in the Trossachs is frozen over. A young man and woman walk across the ice to the historic island of Inchmahome which lies in the middle of the lake. Only the man comes back. Four months later, as staff prepare the ruined abbey for summer visitors, they discover the remains of the body of a girl, her skull violently crushed. Her identity is unknown. Twenty years on, retired detective Alan Narey is still troubled by the unsolved crime. Determined to relieve her father’s torment, DS Rachel Narey, now returns to Lake Menteith and unofficially ‘reopens’ the cold case. Rachel discovers that the one man her father had instinctively suspected of being the killer has died. The police are not prepared to admit that there is anything more to the accident and Rachel must investigate the link without their help. But when she prepares a dangerous gambit, using a covert email operation to uncover the killer's identity, she puts herself in more danger than she could ever have imagined. Cold as the Grave is due to be published in June 2012. With clipped chapters, the pace ratchets up when the couple discover at the scan that they are expecting twins, a boy and a girl – but once the children arrive, then Klaesson’s problems really begin, because these two babies are not what their parents expected. With unearthly intelligence, the Klaesson children are ‘more than human’, and soon the dangers that John and Naomi had been dodging are far closer to home. A surreal journey of ethics, science, and religion – and as far away from the dark alleyways of Roy Grace’s Brighton as one could get, but a blindingly hot read set at the edges of our reality and indicative that Peter James can carve a thriller as tortuous as the DNA Double-Helix – In a word, remarkable. We were impressed to hear that Peter James will be the inaugural author for Dubai’s new ground-breaking year-long literature program, The Open Door Series. This is a very prestigious honour that proves how hard James, the current Crime Writers Association Chair is opening-doors for his fellow genre writers. Peter James has been a staunch advocate in opposing the snobbery that genre writers sometimes face from “the literati”. He will be the first international author to embrace the series of events at the Dar Al Adaab, Dubai’s new home of literature, recently opened by the organisers of the Emirates Airline Festival of Literature. This marks the beginning of a new direction for the festival and the literary life of the city. As well as the full five day Festival which takes place in Dubai 6-10 March 2012, literature lovers will now be able to look forward to sessions, master-classes and work-shops on a broad range of topics. The events will play an integral part in supporting the festival’s core mission of education and its aim to touch at least 20,000 young people this year. Festival organisers have already attracted world class authors, writers, poets and journalists including David Nicholls, Michael Portillo, Darren Shan, Jacqueline Wilson and Terry Wogan for the 2012 programme which was previewed last week. The author list and programme is expected to develop every week. “We are thrilled and grateful to have this lovely historic house to call home and to start our programme of inclusive, open door year round events with the wonderful Peter James, who was one of our founding Festival authors,” she added. Dar Al Adaab (House of Literature)’ is a traditional ‘bakheel’ (wind tower) house and is one of the first permanent structures to be built in Dubai in the late 19th century. It is located in the Bastakiya heritage area of Dubai, the oldest part of the city. Built around a traditional courtyard and retaining many of its original features, the house has been refurbished to provide offices for festival staff, reading rooms, workshop rooms, speaking platforms and two bedrooms for visiting authors and authors-in-residence. It has been given to the Emirates Airline Festival of Literature by Dubai Culture & Arts Authority (Dubai Culture), partners of the LitFest. Photo © 2011 Ali Karim “Peter James with his US publisher Hector De-Jean of Minotaur Books” at Bouchercon St Louis.